Hello friends, and happy November! I can hardly believe that late autumn has arrived. This week has been rather dreary, but apart from missing our long walks to the park, we are enjoying the change of weather. I can hardly help daydreaming (just a little!) of Christmastime, although I want to cherish each week as it comes. This gorgeous fall table setting is by Bre from Rooms For Rent. I absolutely love Bre’s relaxed and warm decor! Here she blends traditional and farmhouse style so well with wooden candlesticks, classic white dishes, and copper flatware. Bre also has such a sweet spirit and I love reading her heartfelt posts. 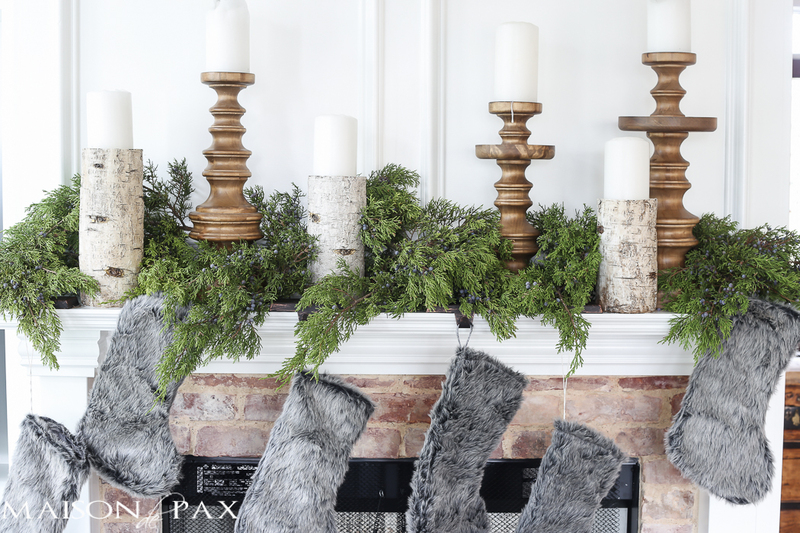 Rachel from Maison de Pax styled this winter woodland Christmas mantle last year, and it is the perfect blend of cozy and rustic. 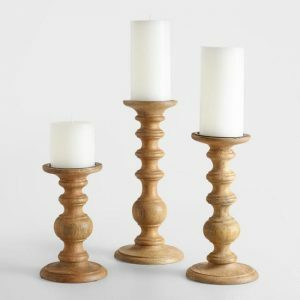 I love the simple garland and the combination of birch and wooden candleholders. 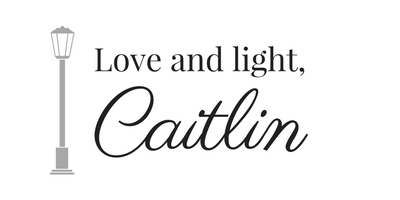 Rachel’s blog is so inspirational, and she offers many great tips for new bloggers! 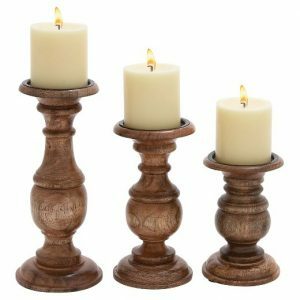 These lovely candlesticks would make a great addition to your collection of decor staples without breaking the bank. Just be sure to read the description when purchasing budget-friendly pieces, because they may be crafted of cheaper materials. 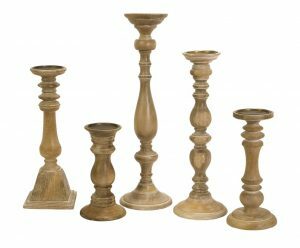 Everyone has their own definition of “splurge,” but to me, spending more that $20 on a candlestick is a bit radical right now. 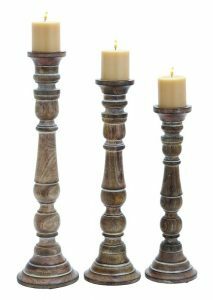 However, these are higher quality pieces that could be styled around the home for many years, making them a worthy investment. 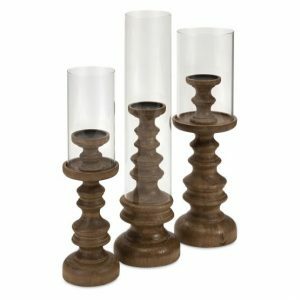 These candleholders are not wooden, but I discovered them during my turned candlestick hunt and just had to share. 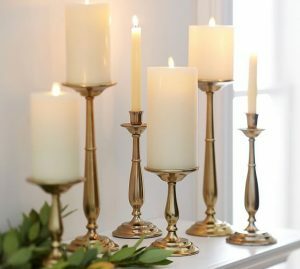 Brass candlesticks are so classic, and I love these ones from Pottery Barn. 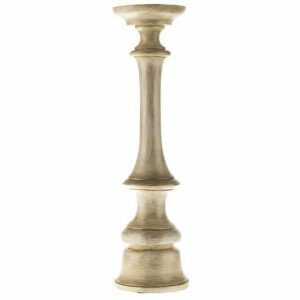 (You can also find brass candlesticks at thrift stores!) 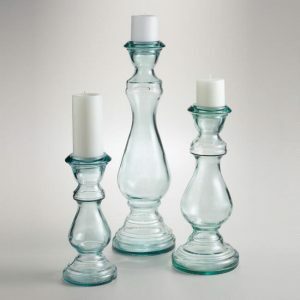 The glass pillar candleholders are beautiful, and add a touch of whimsy with their unexpected material. 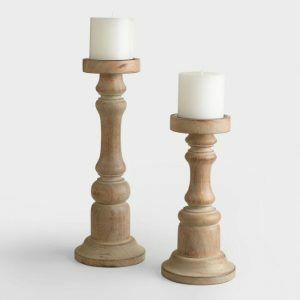 Both styles would pair well with farmhouse or traditional decor. Thank you so much for stopping by today, friends! If you have any additions to my list of finds, please share them in the comments below, or let me know which style you like best! 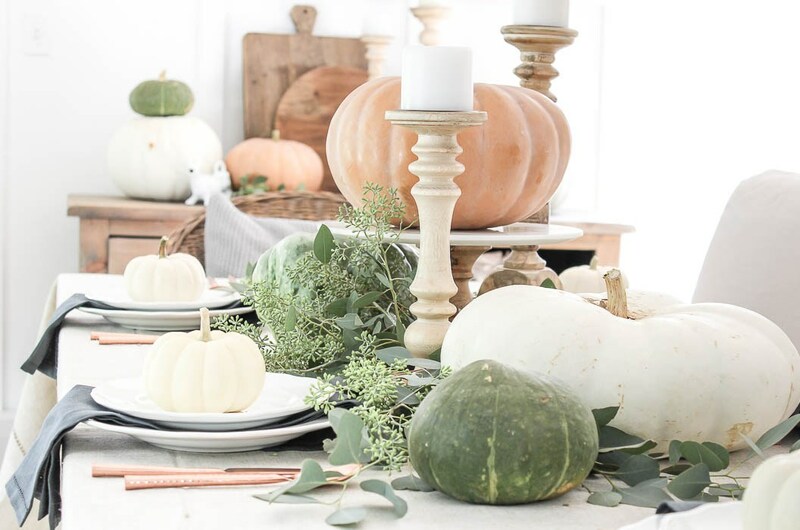 I have a Thanksgiving tablescape coming to the blog soon, so be sure to check back, or sign up for my email list below. Have a bright day!